It’s bubbles upon bubbles at The Secret Yurts in Powys, mid-Wales, where you can sit in a frothing hot tub and enjoy a flute of champagne at the same time. 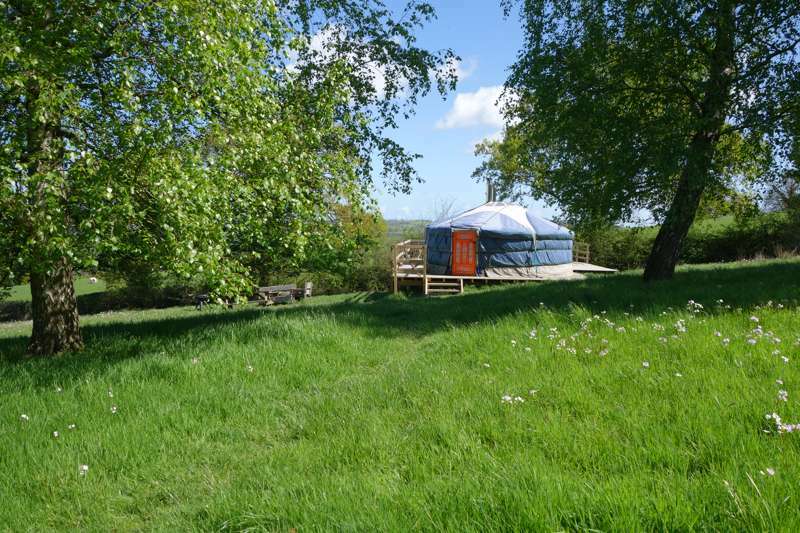 The image sort of sums this glamping site up. It’s a place where luxury reigns supreme and no detail is spared. Is it really a secret? 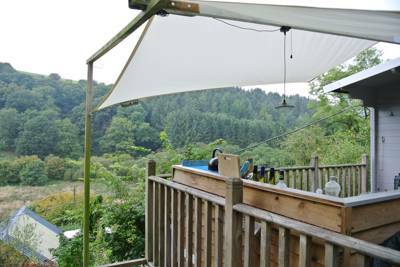 No – the site has only been open since 2014 and is already well known through word of mouth alone – but what it can still boast, is a wonderfully secluded location, tucked away in the rural lanes of Powys. Here, luxury living meets a serene setting and only adults are allowed… so keep the bubbles coming we say! 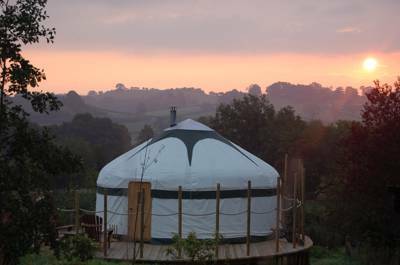 The site itself is comprised of just three traditionally designed yurts spread their own spacious field, with full access to all the modern amenities. 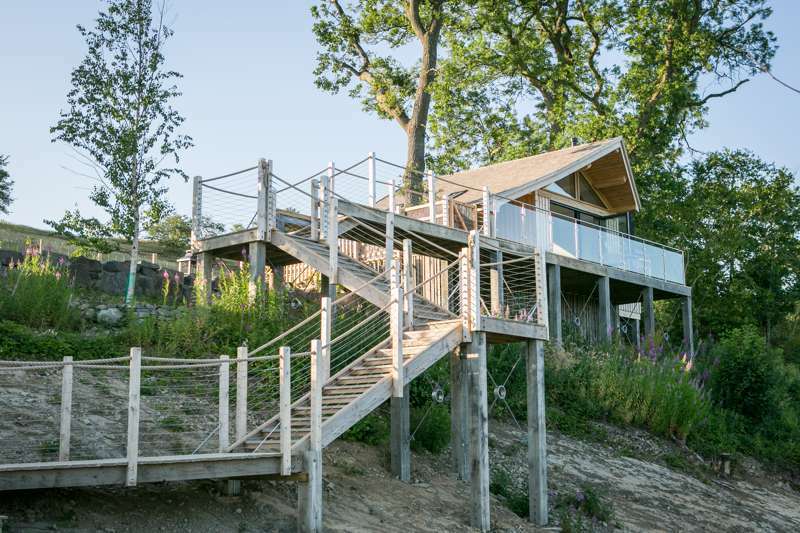 Each cosy abode sits perched atop wooden platform, with excellent views to enjoy from the deck chairs on the decking. 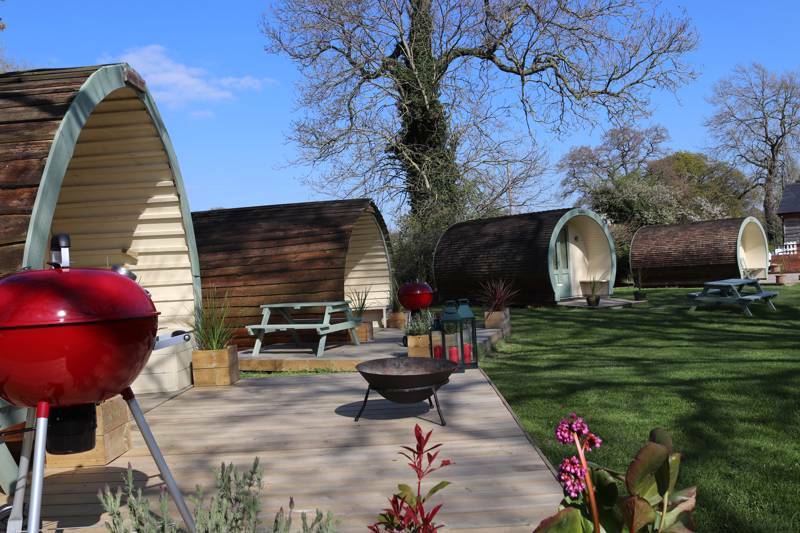 While certain features have become staples of the glamping world – king-sized beds, a log burner, chunky wooden furnishings and your own private bathroom – The Secret Yurts has gone several steps beyond. Thoughtful extra touches like toiletries, dressing gowns and an endless supply of logs are a real treat, while a wooden, Finnish sauna and a seriously up-market hot tub make it a glamping site for truly retreating, rather than a simple stop-off along the road. 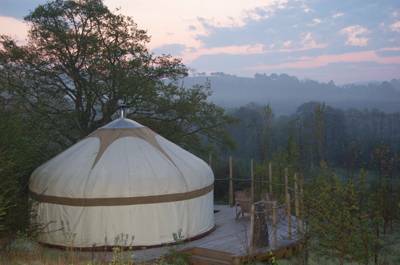 Indeed, pluck for the ‘Birch’ yurt and you even get a private wood-fired hot tub all to yourself. You might never end up leaving! For all these indulgences, however, the site has still managed to earn itself a silver award from Green Tourism in recognition of its eco credentials. 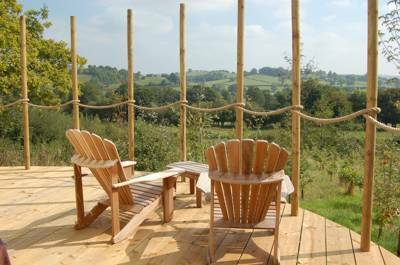 Hot water is provided through ground source heating and solar panels, logs for the fire are sustainably sourced, and the fancy rainwater harvesting system that keeps excess water use to a minimum. It’s all pretty remarkable when you factor in the fully equipped kitchen that also has to be run – accessible for all guests to use and stocked with everything you could need. When you do find time to leave the site – fingers like wrinkly prunes from too long in the hot tub – there’s plenty to be found. It’s a 20 minute drive to Powis Castle and a little longer to breathtaking Lake Vyrnwy, with bikes for hire and boats to take out. Or make the 45-minute journey to Snowdonia National Park where you can hike the hills and really earn your night's rest back at camp. Not that you need go that far. Several footpaths lead directly from the glampsite if you fancy taking a stroll. Just remember to note where you started, since The Secret Yurts isn’t marked by name on any OS maps. Maybe pretty secret then after all! A two night stay in Oak or Rowan in low season is £270 at the weekend; £230 during the week. A two night stay in Oak or Rowan in high season is £280 at the weekend; £260 during the week. Birch Yurt has it’s own private wood fired hot tub on it's deck just outside the yurt the price for a two night stay is £320.